Pat Fitzgerald looks on from the sideline. The coach said windy conditions at Ryan Field played into his decision-making Saturday. Northwestern battled with Iowa on the ground Saturday. But above it, the Wildcats had to contend with an invisible foe — a strong wind that played a large role in coaching decisions throughout the game. Blowing toward Ryan Field’s north end zone, the gusts played havoc with the kicking game for both teams the entire day. They turned average punts into tremendous ones and made chip-shot field goals near-impossible feats of leg strength. Nature’s impact was a big talking point after a contest that went down to the wire. 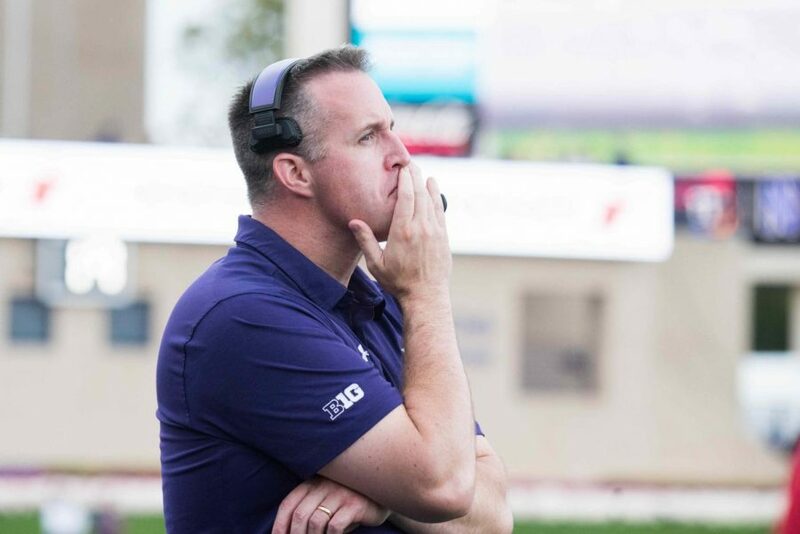 NU (4-3, 2-2 Big Ten) ultimately won 17-10 in overtime, but coach Pat Fitzgerald said the wind played a major factor in many key choices that brought the Cats to that point. For example, when asked for an explanation of his choice to run out the clock with 1:30 remaining after the Hawkeyes (4-3, 1-3) knotted the score at 10 late, Fitzgerald said the elements were at the top of his mind. The Cats drove into the gusts in the second and fourth quarters Saturday. That severely limited the range of freshman kicker Charlie Kuhbander, who could be seen coming up short on 40-yard field goals during warmups before the second half. As a result, four of NU’s six fourth down attempts came at or within Iowa’s 30, driving toward the south end zone. The Cats converted on just one of those four plays. The conditions were also a boon for both teams’ punters. Both Iowa and NU averaged better than 50 yards per punt on the day, booming kicks with the wind at their backs. Out of a host of punting highlights on the day, senior Hunter Niswander’s 80-yard boot shined the brightest. A favorable roll at the end of a long kick took the ball from the Cats’ 17 to the Hawkeyes’ 3, providing a nice boost at the start of the second half. It was the longest punt in the Big Ten so far this season. Thorson said the wind didn’t impact the offense during the game, but Fitzgerald said it factored into many of his decisions, from a swap of punt returners to the direction of play in the overtime period. In a close game filled with critical coaching choices, the gusts became a surprise starring character.